In 2015, Cyclone Pam devastated the islands of Vanuatu in the South Pacific. In response to the Category 5 Cyclone, I was asked by the World Bank to coordinate a humanitarian drone mission to speed up the damage assessments. But I couldn’t find any local drone pilots at the time, so had to recruit two foreign drone companies from Australia and New Zealand instead. Their drone pilots did a great job under challenging conditions over the course of several weeks. I continue to be in touch with them and continue to learn from them. They’re top notch professionals. I’m just really tired of seeing videos like the one above. Foreigners with the technology; locals as passive observers. It should of course be the other way around: Locals with the technology and foreigners as passive observers; foreigners holding umbrellas for local drone pilots. Seriously. Why can’t it be the other way around? Fast forward to 2018. The South Pacific has been battered by an onslaught of major cyclones, no fewer than 4 in almost as many months. Unlike 2015, one local drone pilot deployed to the affected areas to support the relief efforts. Her name is Amrita Lal (pictured below) and she serves as the Coordinator of South Pacific Flying Labs based in Fiji. In deploying with the Red Cross following Cyclone Keni, Amrita became the first local drone pilot to deploy with a National Red Cross Society in the region. Our mission at WeRobotics is to localize opportunity. We create local opportunities to participate in problem solving, to take the lead in problem solving, to be a real part of the solution, to have meaningful and sustainable impact. By localizing expertise in robotics, we create new opportunities to scale humanitarian aid, sustainable development, public health or nature conservation efforts locally. In so doing, we create local opportunities for professional development and upward mobility. How do we create and sustain these new opportunities? By localizing emerging technologies through our Flying Labs. (We like to call them Wakanda Flying Labs). Demand for the skills that Amrita and her Flying Labs have is growing. This is the “Fourth Industrial Revolution” (4IR) after all: the rise of Robotics and Artificial Intelligence is reshaping the global labor market, shutting down some job opportunities entirely while creating new ones. This is a disruptive time in human history. And we know from previous industrial revolutions that they create divides between the “have’s” and “have nots”; between the included and the excluded; between those who have access to new opportunities and those who don’t. The First Industrial revolution was powered by the steam engine along with the iron and textile industries. The second was powered by steel, oil and electricity. Digital technologies unleashed the Third Industrial Revolution. Each these revolutions created new opportunities for some (usually in high-income countries), and obliterated existing opportunities for others (usually in low-income countries). The Fourth Industrial Revolution is creating new jobs in lower-income countries. But these jobs are almost always taken by foreign companies from higher-income countries. Why? Either because the local talent doesn’t exist, or because said local talent is not visible or connected to these new job opportunities. Our Flying Labs serve to overcome these unjust hurdles. Fact is, foreign companies are more expensive to hire. Foreign drone pilots need more time to deploy. They need international flights and hotels. They often don’t know the countries that they’re sent to and rarely know the local languages or customs. This creates an exciting business opportunity for Amrita and Marco, and their colleagues at other Flying Labs in Africa, Asia and Latin America. Robotics enables new business opportunities because robots enable an entirely new form of mobility—autonomous mobility. Autonomous mobility in the air (flying drones), in the oceans (swimming drones) and on land (driving drones). Mobility gives freedom, which creates new opportunities (think of the automotive revolution). This explains why we are committed to helping our Flying Labs and their partners use autonomous robotics to overcome the challenge of mobility in humanitarian aid, sustainable development, nature conservation and public health. We’ve borrowed some of this language from our new friends at World Bicycle Relief because their approach is similar to ours: It isn’t about the technology—bicycle or drone—it’s about localizing this technology sustainably and respectfully to create new opportunities. So yes, we localize robotics. But that’s hardly the point. Robotics is simply a means to an end. We localize opportunities to scale local solutions. We localize opportunities to enable direct and local participation in the Fourth Industrial Revolution. 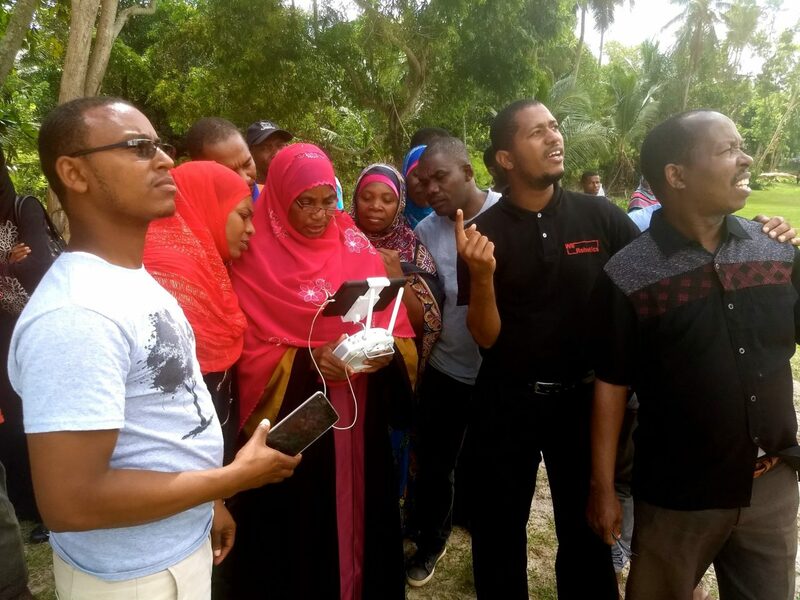 This explains why our Flying Labs are directly connected to each other; why Amrita from Pacific Flying Labs recently trained Leka and Team from Tanzania Flying Labs on how to use underwater drones; why Dania, Oscar and Humberto from Panama Flying Labs are working with us to create engineering solutions with Pacific Flying Labs; why Tanzania Flying Labs is helping to incubate Kenya Flying Labs and why Nepal Flying Labs is learning about cargo drones from Flying Labs in Peru and the Dominican Republic. Each of these connections in the Flying Labs network create new opportunities to participate in the Fourth Industrial Revolution. 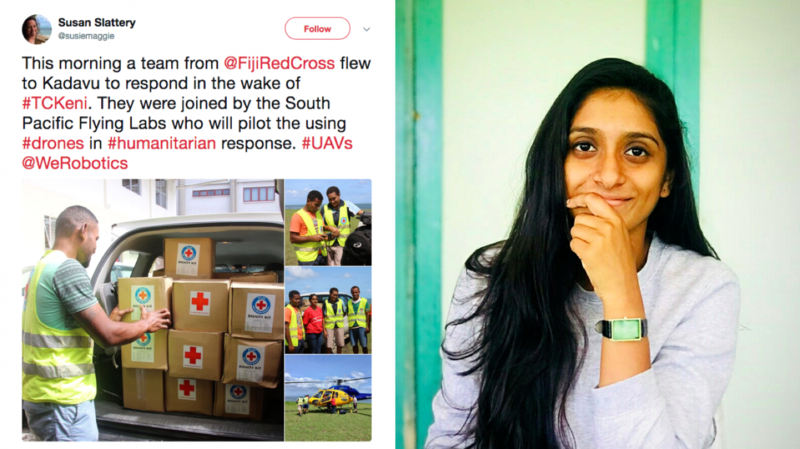 Amrita was presented with an important opportunity to become the first local, female drone pilot in her region to deploy with a National Red Cross Society. She grabbed it and ran with it. This experience has opened up new opportunities for her and her Flying Labs team in the Pacific. This includes incubating a new hub of Pacific Flying Labs in Vanuatu in coming months. So the next time Vanuatu has to deal with a major tropical cyclone or other consequences of climate change, the World Bank must not hire me or hire any foreign drone pilots to accelerate their damage assessments. No, they should instead hire Amrita and her team of drone natives from Pacific Flying Labs. In 2017, WeRobotics was one of more than 500 teams to compete in the MIT Solve Challenge on Youth, Skills and Workforce of the Future. Only 2% were selected as winners, and only 1% of all the applicants received dedicated funding from the Australian Department of Foreign Affairs and Trade (DFAT) and the Atlassian Foundation. Our pitch focused on building the foundations of South Pacific Flying Labs. By winning the MIT Solve Award and securing funding from DFAT, Atlassian and the University of the South Pacific (USP), Pacific Flying Labs has been able to join our global and growing network of Flying Labs; including labs in Nepal, Tanzania, Uganda, Peru, Dominican Republic and soon Brazil, Panama, Senegal and Philippines. Pacific Flying Labs is the first of our labs to have a strong focus on preparing youths for the workforce of the future. Pacific Labs is a joint collaboration with USP and the university’s Geospatial Sciences Program, which is where the lab is based. Amrita Lal, an alum of USP’s program, leads the work of Pacific Flying Labs from Fiji. In the weeks and months following our successful pitch to the MIT Solve Challenge, Amrita along with WeRobotics, USP faculty and volunteers organized two dedicated trainings and projects with youths from Fiji. Amrita and team also organized and ran the first ever drones for good conference in the South Pacific, bringing together key stakeholders from Fiji and the region to catalyze new partnerships for future projects. The youths who participated in the trainings and projects included young women and men from local schools and local orphanages. In addition, undergraduate students from USP also participated in trainings on campus. As part of this initiative, WeRobotics transferred 2 underwater drones and 2 aerial drones to South Pacific Flying Labs along with tablets and relevant software. The first training and project focused on the use of marine robotics to study the health of coral reefs. Participants learned how to use underwater drones safely and effectively. They captured over an hour of underwater footage from a pier off Maui Bay. The following day, at the USP GIS Lab, they teamed up into groups and analyzed the footage. The groups learned to identify the different species of fish (particularly butterfly fish) and corals visible in the footage in order to assess the health of the corals. They also learned about how marine life is impacted by human activity including climate change. They subsequently created powerpoint slides and presented their findings and recommendations to each other. After their presentations, participants were trained on how to use aerial drones safely and effectively. This training was carried out at an approved field on USP campus. The women who participated in these trainings and projects ranged from 12 to 18 years in age and all but one were from a local orphanage. The second training and project focused on the use of aerial drones for a disaster risk reduction at an informal settlement near USP campus. The training began with a lecture on the use of drones in disaster response. This training comprised both manual flights and automated flights. The latter taught participants how to program and supervise flight plans. Following this training, the youths worked with Pacific Flying Labs to map an informal settlement. Once the imagery was collected, participants returned to the lab to process and analyze the imagery. More specifically, they teamed up into groups to identify health risks, safety concerns and vulnerabilities to natural hazards. They subsequently created powerpoint slides and presented their findings and recommendations to each other. Their findings were subsequently shard with the Red Cross. Young men (aged 17-18) and one young woman (aged 17) participated in this second training and project. Some of the youths who participated in the marine training & project also joined the aerial robotics training & project. Once the trainings and projects were completed, Pacific Flying Labs and WeRobotics met with key stakeholders and prospective partners to explore collaboration opportunities. This included meetings with the Australian Red Cross (pictured below), Fiji Red Cross, Secretariat of Pacific Communities (SPC), World Mosquito Program (WMP) and Suva Fire Service, for example. In addition, live demos of cargo flights were given to both to the Civil Aviation Authority and to USP students and faculty (video below). Also, initial training on marine drones was provided to USP students at the swimming pool on campus. In total, 21 USP students joined our aerial and marine drone demos and lectures. The first phase of our work with Pacific Flying Labs culminated with a full day workshop on the use of drones for social good in the South Pacific. This was the first convening of it’s kind in the region, and brought together key stakeholders to address common challenges, identify opportunities and to create new strategic partnerships. These stakeholders included the Fiji Red Cross, Australian Red Cross, Australian Center for Field Robotics, Secretariat of the Pacific Community (SPC) and several other groups. Two youths who participated in both sets of trainings/projects opened the workshop by presenting their findings (photo below; the young woman in this photo is not one of the vulnerable youths who participated in the trainings/projects). This opening session was followed by a series of talks from local and international participants working on drones projects in the region. During the afternoon sessions, participants discussed common challenges and new partnership opportunities. Over 30 participants from 8 different organizations participated in the workshop. Four new strategic partnership opportunities were identified between Pacific Labs and the following organizations as a result: Red Cross, SPC, World Mosquito Program and Australian Center for Field Robotics. Today, Fiji is being hit by a second cyclone in just as many weeks. Amrita and team are already in touch with the Fiji Red Cross and are on standby to support the disaster response and recovery work after Cyclone Keni barrels through. So instead of hiring drone companies from Australia or further afield, organizations like the Red Cross, UN and World Bank can hire young drone pilots from Fiji to support a wide range of humanitarian, development and environmental projects. Local pilots can respond more quickly than foreign pilots; plus they know the country better, speak the local language, understand local traditions and have lower overhead costs. This is just one several ways we plan to prepare youths in the region for the workforce of the future. WeRobotics Global has become a premier forum for social good robotics. The feedback featured above was unsolicited. On June 1, 2017, we convened our first, annual global event, bringing together 34 organizations to New York City (full list below) to shape the global agenda and future use of robotics in the social good sector. WeRobotics Global was kindly hosted by Rockefeller, the first donor to support our efforts. They opened the event with welcome remarks and turned it over to Patrick Meier from WeRobotics who provided an overview of WeRobotics and set the big picture context for social robotics. The first panel featured our Flying Labs Coordinators from Tanzania (Yussuf), Peru (Juan) and Nepal (Uttam). Each shared the hard work they’ve been doing over the past 6-10 months on localizing and applying robotics solutions. Yussuf spoke about the lab’s use of aerial robotics for disaster damage assessment following the earthquake in Bukoba and for coastal monitoring, environmental monitoring and forestry management. He emphasized the importance of community engagement and closed with new projects that Tanzania Flying Labs is working on such as mangrove monitoring for the Department of Forestry. Juan presented the work of the labs in the Amazon Rainforest, which is a joint effort with the Peruvian Ministry of Health. Together, they are field-testing the use of affordable and locally repairable flying robots for the delivery of antivenom and other medical payload between local clinics and remote villages. Juan noted that Peru Flying Labs is gearing up to carry out a record number of flight tests this summer using a larger and more diverse fleet of flying robots. Last but not least, Uttam showed how Nepal Flying Labs has been using flying robots for agriculture monitoring, damage assessment and mapping of property rights. He also gave an overview of the social entrepreneurship training and business plan competition recently organized by Nepal Flying Labs. This business incubation training has resulted in the launch of 4 new Nepali start-up companies focused on Robotics-as-a-Service. The following videos provide highlights from each of our Flying Labs: Tanzania, Peru and Nepal. The second panel featured talks on sector based solutions starting with the International Federation of the Red Cross (IFRC). The Federation (Aarathi) spoke about their joint project with WeRobotics; looking at cross-sectoral needs for various robotics solutions in the South Pacific. IFRC is exploring at the possibility of launching a South Pacific Flying Labs with a strong focus on women and girls. Pix4D (Lorenzo) addressed the role of aerial robotics in agriculture, giving concrete examples of successful applications while providing guidance to our Flying Labs Coordinators. The Wall Street Journal (Sally) spoke about the use of aerial robotics in news gathering and investigative journalism. She specifically emphasized the importance of using flying robots for storytelling. Duke Marine Labs (David) closed the panel with an overview of their projects in nature conservation and marine life protection, highlighting their use of machine learning for automated feature detection for real-time analysis. Panel number three addressed the transformation of transportation. UNICEF (Judith) highlighted the field tests they have been carrying out in Malawi; using cargo robotics to transport HIV samples in order to accelerate HIV testing and thus treatment. UNICEF has also launched an air corridor in Malawi to enable further field-testing of flying robots. MSF (Oriol) shared their approach to cargo delivery using aerial robotics. They shared examples from Papua New Guinea (PNG) and emphasized the importance of localizing appropriate robotics solutions that can be maintained locally. MSF also called for the launch of PNG Flying Labs. IAEA was unable to attend WeR Global, so Patrick and Adam from WeRobotics gave the talk instead. WeRobotics is teaming up with IAEA to design and test a release mechanism for sterilized mosquitos in order to reduce the incidence of Zika and other mosquito-borne illnesses. More here. Finally, Llamasoft (Sid) closed the panel with a strong emphasis on the need to collect and share structured data to accurately carry out comparative cost-benefit-analyses of cargo delivery via flying robots versus conventional means. Sid used the analogy of self-driving cars to highlight how problematic the current lack of data vis-a-vis reliably evaluating the impact of cargo robotics. The fourth and final panel went beyond aerial robotics. Digger (Thomas) showed how they convert heavy construction vehicles into semi-autonomous platforms to clear landmines and debris in conflict zones like Iraq and Syria. Science in the Wild (Ulyana) was alas unable to attend the event, so Patrick from WeRobotics gave the talk instead. This focused on the use of swimming robots to monitor glacial lakes in the Himalaya. The purpose of the effort is to identify cracks in the lake floors before they trigger what local villagers call the tsunamis of the Himalaya. OpenROV (David) gave a talk on the use of diving robots, sharing real-world examples and providing exciting updates on the new Trident diving robot. Planet Labs (Andrew) gave the closing talk, highlighting how space robotics (satellites) are being used across a wide range of social good projects. He emphasized the importance of integrating both aerial and satellite imagery to support social good projects. The final session at WeR Global comprised breakout groups to identify next steps for WeRobotics and the social good sector more broadly. Many quality insights and recommendations were shared during the report back. One such recommendation was to hold WeR Global again, and sooner rather than later. So we look forward to organizing WeRobotics Global 2018. We will be providing updates via our blog and email list. We will also use our blog and email list to share select videos of the individual talks from Global 2017 along with their respective slide decks. In the meantime, a big thanks to all participants and speakers for making Global 2017 such an unforgettable event. And sincerest thanks to the Rockefeller Foundation for hosting us at their headquarters in New York City. UN Office for the Coordination of Humanitarian Affairs (OCHA), International Federation of the Red Cross (IFRC), World Food Program (WFP), UN Development Program (UNDP),Médecins Sans Frontières (MSF), UNICEF, World Bank, World Economic Forum (WEF), Cadasta, Scripps Institute of Oceanography, Duke Marine Labs, Fauna and Flora International, Science in the Wild, Drone Journalism Lab, Wall Street Journal, ESRI, Pix4D, Radiant, OpenAerialMap, Planet Labs, Llamasoft, Amazon Prime Air, senseFly, OpenROV, Digger, UPenn Robotics, Institute of Electrical and Electronics Engineers (IEEE), Rockefeller Foundation, Gates Foundation, Omidyar Network, Hewlett Foundation, USAID and Inter-American Development Bank (IADB). Humanitarian Robotics: The $15 Billion Question? The International Community spends around $25 Billion per year to provide life saving assistance to people devastated by wars and natural disasters. According to the United Nations, this is $15 Billion short of what is urgently needed; that’s $15 Billion short every year. So how do we double the impact of humanitarian efforts and do so at half the cost? Perhaps one way to deal with this stunning 40% gap in funding is to scale the positive impact of the aid industry. How? By radically increasing the efficiency (time-savings) and productivity (cost-savings) of humanitarian efforts. This is where Artificial Intelligence (AI) and Autonomous Robotics come in. The World Economic Forum refers to this powerful new combination as the 4th Industrial Revolution. Amazon, Facebook, Google and other Top 100 Fortune companies are powering this revolution with billions of dollars in R&D. So whether we like it or not, the robotics arms race will impact the humanitarian industry just like it is impacting other industries: through radical gains in efficiency & productivity. What makes this new industrial revolution different from those that preceded it is the fundamental shift from manually controlled technologies—a world we’re all very familiar with—to a world powered by increasingly intelligent and autonomous systems—an entirely different kind of world. One might describe this as a shift towards extreme automation. And whether extreme automation powers aerial robotics, terrestrial robotics or maritime robots (pictured below) is besides the point. The disruption here is the one-way shift towards increasingly intelligent and autonomous systems. Why does this fundamental shift matter to those of us working in humanitarian aid? For at least two reasons: the collection of humanitarian information and the transportation of humanitarian cargo. Whether we like it or not, the rise of increasingly autonomous systems will impact both the way we collect data and transport cargo by making these processes faster, safer and more cost-effective. Naturally, this won’t happen overnight: disruption is a process. Humanitarian organizations cannot stop the 4th Industrial Revolution. But they can apply their humanitarian principles and ideals to inform how autonomous robotics are used in humanitarian contexts. Take the importance of localizing aid, for example, a priority that gained unanimous support at the recent World Humanitarian Summit. If we apply this priority to humanitarian robotics, the question becomes: how can access to appropriate robotics solutions be localized so that local partners can double the positive impact of their own humanitarian efforts? In other words, how do we democratize the 4th Industrial Revolution? Doing so may be an important step towards closing the $15 billion gap. It could render the humanitarian industry more efficient and productive while localizing aid and creating local jobs in new industries. Should developing countries seek to manufacture their own robotics solutions in order to establish payload delivery services? What business models make the most sense to sustain these services? Do decision-support tools already exist to determine which delivery routes are best served by aerial robots (drones) rather than traditional systems (such as motorbikes)? And what mechanisms should be in place to ensure that the impact of robotics solutions on local employment is one of net job creation rather than job loss? There are some of the questions I’ve been thinking about and discussing with various colleagues over the past year vis-a-vis humanitarian applications. So let me take the first 2 questions and explore these further here. I’ll plan on writing a follow up post in the near future to address the other two questions. First, should developing countries take advantage of commercial solutions that already exist to build their robotics delivery infrastructure? Or should they seek instead to manufacture these robotics platforms locally instead? The way I see it, this does not have to be an either/or situation. Developing countries can both benefit from the robust robotics technologies that already exist and take steps to manufacture their own solutions over time. This is not a hypothetical debate. I’ve spent the past few months going back and forth with a government official in a developing country about this very question. The official is not interested in leveraging existing commercial solutions from the West. As he rightly notes, there are many bright engineers in-country who are able and willing to build these robotics solutions locally. Here’s the rub, however, this official has no idea just how much work, time and money is needed to develop robust, reliable and safe robotics solutions. In fact, many companies in both Europe and the US have themselves completely under-estimated just how technically challenging (and very expensive) it is to develop reliable aerial robotics solutions to delivery payloads. This endeavor easily takes years and millions of dollars to have a shot at success. It is far from trivial. The government official in question wants his country’s engineers to build these solutions locally in order to transport essential medicines and vaccines between health clinics and remote villages. Providing this service is relatively urgent because existing delivery mechanisms are slow, unreliable and at times danger-ous. So this official will have to raise a substantial amount of funds to pay local engineers to build home-grown robotics solutions and iterate accordingly. This could take years (with absolutely no guarantee of success mind you). On the other hand, this same official could decide to welcome the use of existing commercial solutions as part of field-tests in-country. The funding for this would not have to come from the government and the platforms could be field-tested as early as this summer. Not only would this provide local engineers with the ability to learn from the tests and gain important engineering insights, they could also be hired to actually operate the cargo delivery services over the long-term, thus gaining the skills to maintain and fix the platforms. Learning by doing would give these engineers practical training that they could use to build their own home-grown solutions. One could be even more provocative: Why invest so much time and effort in local manufacturing when in-country engineers and entrepreneurs could simply use commercial solutions that already exist to make money sooner rather than later by providing robotics as a service? We’ve seen, historically, the transition from manufacturing to service-based economies. There’s plenty of profit to be made from the latter with a lot less start-up time and capital required. And again, one strategy does not preclude the other, so why forgo both early training and business opportunities when these same opportunities could help develop and fund the local robotics industry? Admittedly, I’m somewhat surprised by the official’s zero tolerance for the use of foreign commercial technology to improve his country’s public health services; that same official is using computers, phones, cars, televisions, etc., that are certainly not made in-country. He does not have a background in robotics, so perhaps he assumes that building robust robotics solutions is relatively easy. Simply perusing the past 2 years of crowdfunded aerial robotics projects will clearly demonstrate that most have resulted in complete failure despite raising millions of dollars. That robotics graveyard keeps growing. But I fully respect the government official’s position even if I disagree with it. In my most recent exchange with said official, I politely re-iterated that one strategy (local manufacturing) does not preclude the other (local business opportunities around robotics as service using foreign commercial solutions). Surely, the country in question can both leverage foreign technology while also building a local manufacturing base to produce their own robotics solutions. Second, on business models, which models can provide sustainability by having aerial delivery services be profitable earlier rather than later? I was recently speaking to a good colleague of mine who works for a very well-respected humanitarian group about their plans to pilot the use of aerial robotics for the delivery of essential medicines. When I asked him about his organization’s business model for sustaining these delivery services, he simply said there was no model, that his humanitarian organization would simply foot the bill. Surely we can do better. Just think how absurd it would be for a humanitarian organization to pay for their own 50 kilometer paved road to transport essential medicines by truck and decide not to recoup those major costs. You’ve paid for a perfectly good road that only gets used a few times a day by your organization. But 80% of the time there is no one else on that road. That would be absurd. Humanitarians who seek to embark on robotics delivery projects should really take the time to understand local demand for transportation services and use-cases to explore strategies to recoup part of their investments in building the aerial robotics infrastructure. Surely remote communities who are disconnected from health services are also disconnected from access to other commodities. Of course, these local villages may not benefit from high levels of income; but I’m not suggesting that we look for high margins of return. Point is, if you’ve already purchased an aerial robot (drone) and it spends 80% of its time on the ground, then talk about a missed opportunity. Take commercial aviation as an analogy. Airlines do not make money when their planes are parked at the gate. They make money when said planes fly from point A to point B. The more they fly, the more they transport, the more they profit. So pray tell what is the point of investing in aerial robots only to have them spend most of their lives on the ground? Why not “charter” these robots for other purposes when they’re not busy flying medicines? The fixed costs are the biggest hurdle with respect to aerial robotics, not the variable costs. Autonomous flights themselves cost virtually nothing; only 1-2 person’s time to operate the robot and swap batteries & payloads. Just like their big sisters (manually piloted aircraft), aerial robots should be spending the bulk of their time in the sky. So humanitarian organizations really ought to be thinking earlier rather than later about how to recoup part of their fixed costs by offering to transport other high-demand goods. For example, by allowing local businesses to use existing robotics aircraft and routes to transport top-up cards or SIM cards for mobile phones. What is the weight of 500 top-up or SIM cards? Around 0.5kg, which is easily transportable via aerial robot. Better yet, identify perishable commodities with a short shelf-life and allow business to fly those via aerial robot. The business model that I’m most interested in at the moment is a “Per Flight Savings” model. One reason to introduce robotics solutions is to save on costs—variable costs in particular. Lest say that the variable cost of operating robotics solutions is 20% lower than the costs of traditional delivery mechanisms (per flight versus per drive, for example). You offer the client a 10% cost saving and pocket the other 10% as revenue. Over time, with sufficient flights (transactions) and growing demand, you break even and start to create a profit. I realize this is a hugely simplistic description; but this need not be unnecessarily complicated either. The key will obviously be the level of demand for these transactions. The way I see it, regardless of the business model, there will be a huge first-mover advantage in developing countries given the massive barriers to entry. Said barriers are primarily due to regulatory issues and air traffic management challenges. For example, once a robotics company manages to get regulatory approval and specific flight permissions for designated delivery routes to supply essential medicines, a second company that seeks to enter the market may face even greater barriers. Why? Because managing aerial robotics platforms from one company and segregating that airspace from manned aircraft can already be a challenge (not to mention a source of concern for Civil Aviation Authorities). So adding new (and different types of) robots from a second company requires new communication protocols between the different robotics platforms operated by the 2 different companies. In sum, the challenges become more complex more quickly as new competitors seek entry. And for an Aviation Authority that may already be weary of flying robots, the proposal of adding a second fleet from a different company in order to increase competition around aerial deliveries may take said Authority some time to digest. Of course, if these companies can each operate in completely different parts of a given country, then technically this is an easier challenge to manage (and less anxiety provoking for authorities). But said barriers do not only include technical (though surmountable) barriers. They also include identifying those (few?) use-cases that clearly make the most business sense to recoup one’s investments earlier rather than later given the very high start-up fixed costs associated with developing robotics platforms. Identifying these business cases is typically not something that’s easily done remotely. A considerable amount of time and effort must be spent on-site to identify and meet possible stakeholders in order to brainstorm and discover key use-cases. And my sense is that aerial robots often need to be designed to meet a specific use-case. So even when new use-cases are identified, there may still be the need for Research and Development (R&D) to modify a given robotics platform so it can most efficiently cater to new use-cases. There are other business models worth thinking through for related services, such as those around the provision of battery-charging services, for example. The group Mobisol has installed solar home systems on the roofs of over 40,000 households in Rwanda and Tanzania to tackle the challenge of energy poverty. Mobisol claims to already cover much of Tanzania with solar panels that are no more than 5 kilometers apart. This could enabling aerial robots (UAVs) to hop from recharging station to recharging station, an opportunity that Mobisol is already actively exploring. Practical challenges aside, this network of charging stations could lead to an interesting business model around the provision of aerial robotics services. As the astute reader will have gathered, much of the above is simply a written transcript me thinking out load. So I’d very much welcome some intellectual company here along with constructive feedback. What am I missing? Is my logic sound? What else should I be taking into account? WeRobotics accelerates the use of robotics to solve humanitarian challenges. More specifically, we accelerate the ethical, safe and effective use of robotics to address aid, development and environmental challenges. Robots, such as drones or UAVs, are already transforming multiple industries through rapid & dramatic gains in efficiency and productivity. The impact on the social good sector will be no different. We want to create a world in which every social good organization has access to robotics technologies to solve global and local challenges. Robots are technologies that radically enhance the ability of people to sense and affect physical change. The state of the art in robotics is quickly shifting from manually controlled systems to increasingly intelligent autonomous systems. Aid, development & environmental organizations have yet to take full advantage of these new solutions. The field of robotics is evolving so quickly that the social good sector is largely unaware of the possibilities let alone how to translate this potential into meaningful impact. As a result, robotics solutions are often over-looked or worse: seen as a threat rather than a unique opportunity to accelerate social good. We turn this perceived threat into powerful new opportunities for both the technology and social good sectors. Aerial robotics (or UAVs) represent the first wave of robotics to impact the social good sector by disrupting traditional modes of data collection and payload delivery. In fact, aerial robotics is the current leading edge of humanitarian robotics applications. UAVs stand to offer cost-saving, time-saving and even life-saving solutions by enabling novel ways to collect data and transport payloads. Both timely data and the capacity to act on this data are integral to aid, development and environmental projects. 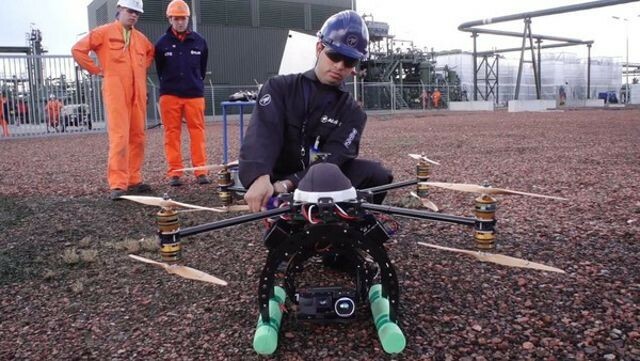 Aerial robotics can thus fulfill two key roles: data collection and payload delivery. Indeed, we’ve already witnessed this use of aerial robotics for social good in dozens countries in recent years including Albania, Bosnia, China, Guyana, Haiti, Japan, Kenya, Liberia, Namibia, Nepal, Papua New Guinea, Philippines, South Africa, Tanzania, Thailand and Vanuatu. The rapid commercialization of consumer UAVs explains why aerial robots are the first—but certainly not the last—wave of intelligent robots to impact the social good space. The second and third waves are already in plain sight: industry and academia are making tremendous strides in both terrestrial and maritime robotics. Like aerial robots, terrestrial and maritime robots will significantly extend people’s ability to collect data and transport payloads. WeRobotics thus seeks to fast-track the social good sector’s access to aerial, terrestrial and maritime robotics to expand the impact of aid, development and environmental projects. The combined impact of increasingly autonomous systems on the social good sector will bring massive change. This will need to be managed carefully. WeRobotics offers dedicated platforms to channel this rapid change ethically, safely and effectively. Cities are the main drivers of innovation, social change, population growth and risk. To this end, WeRobotics is co-creating a global network of city-level labs in countries experiencing cascading risks, rapid development and/or environmental challenges. These localized platforms—our Flying Labs—are co-created with local and international partners to seed the social good sector with direct access to aerial, terrestrial and maritime robotics. The first phase will prioritize the deployment of aerial robotics, hence the name Flying Labs. Once terrestrial and maritime robotics become integrated into the Labs, these will become WeRobotics Labs. Our Lab partners will include industry, academia and social good organizations as evidenced by our recent co-creation of Kathmandu Flying Labs in Nepal. Other local partners in Africa, Asia and South America have recently approached us to explore the possibility of co-creating Flying Labs in their cities as well. Each Lab will focus on sector-based applications of robotics that are directly relevant to the local area’s needs, interests and opportunities. As such, one Lab might lead with the deployment of aerial robotics for data collection in environmental projects while another might prioritize maritime robotics for payload delivery in development projects. A third might focus on autonomous terrestrial robotics for sensing and payload delivery in aid projects. In short, our co-created Labs are launchpads where robotics solutions can be deployed ethically, safely and effectively within each social good sector. WeRobotics will manage the core activities of the Labs through our dedicated sector-based programs—AidRobotics, DevRobotics and EcoRobotics. These programs will partner with aid, development and environmental organizations respectively and with technology partners to carry out joint activities in each Lab. As such, each program is responsible for catalyzing and managing its own sector’s strategic partnerships, hands-on trainings, operational projects, applied research and key events within each of the Labs. Future programs might include HealthRobotics, AgriRobotics and RightsRobotics. Once a Lab is fully trained in one type of robotics technology, such as aerial robotics, local Lab partners carry out future aerial robotics projects themselves. Meanwhile, WeRobotics works on introducing other relevant robotics solutions to the Labs—such as terrestrial and maritime robotics—in close collaboration with other technology partners. WeRobotics also ensures that learning and innovations generated in each Lab are disseminated to all labs in order to accelerate cross-pollination around uses cases and new robotics solutions. WeRobotics is the missing link between robotics companies, academia and social good organizations. We want to catalyze strategic, cross-sectoral partnerships by creating a common purpose, platform and opportunity for these diverse partners to collaborate on meaningful social good projects. WeRobotics is currently a joint exploration between four accomplished professionals. We bring together decades of experience in the humanitarian sector, robotics industry and the private sector. Feedback and/or questions are welcomed via email. I recently had the pleasure of meeting Dr. Robin Murphy when she participated in the 3-day Policy Forum on Humanitarian UAVs, which I organized and ran at the Rockefeller Center in Italy last month. Anyone serious about next generation humanitarian technology should read Robin’s book on rescue robotics. The book provides a superb introduction to the use of robotics in search and rescue missions and doubles as a valuable “how to manual” packed with deep insights, lessons learned and best practices. Rescue robots enable “responders and other stakeholders to sense and act at a distance from the site of a disaster or extreme incident.” While Robin’s focus is predominantly on the use of search-robots for rescue missions in the US, international humanitarian organizations should not overlook the important lessons learned from this experience. As Robin rightly notes, ‘the impact of earthquakes, hurricanes, flooding […] is increasing, so the need for robots for all phases of a disaster, from prevention to response and recovery, will increase as well.” This is particularly true of aerial robots, or Unmanned Aerial Vehicles (UAVs), which represent the first wide-spread use of robotics in international humanitarian efforts. As such, this blog post relays some of the key insights from the field of rescue robots and aerial UAVs in particular. For another excellent book on the use of UAVs for search and rescue, please see Gene Robinson’s book entitled First to Deploy. The second documented deployment of UAVs in Robin’s book occurs in 2009, when a quadrotor used by the Sapienza University of Rome in the aftermath of the L’Aquila earthquake in 2009. Members of the University’s Cognitive Cooperative Robotics Lab deployed the UAV on behalf of the L’Aquila Fire Department. “The deployment in the debris concentrated on demonstrating mobility to fire rescue agencies.” The third documented use of UAVs occurred in Haiti after the 2010 Earthquake. An Elbit Skylark (fixed-wing) UAV was used to survey the state of a distant orphanage near Leogane, just outside the capital. 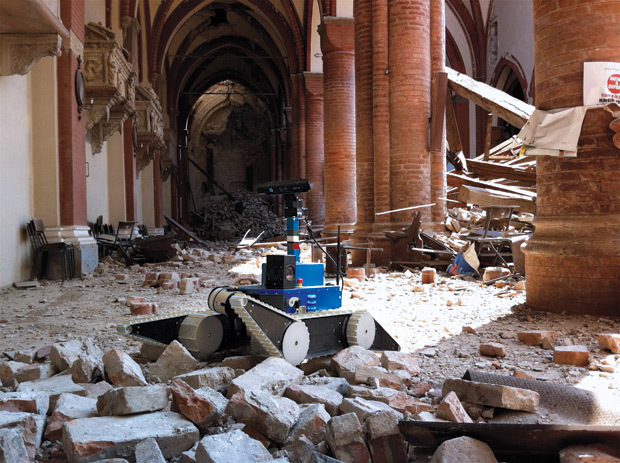 In 2012, a project funded by the European Union (EU) fielded to UAVs following earthquakes in Northern Italy to assess the exteriors of “two churches that had not been entered [for] safety reasons. The robots were successful and provided engineers and cultural historians with information that could not have been obtained otherwise.” UAV deployments following disasters in Haiti in 2012 and the Philippines in 2013 do not appear in the book, unfortunately. In any event, Robin notes that the main barrier to deploying UGVs, UMVs and UAVs “is not a technical issue but an administrative one.” I would add regulatory constraints as another major hurdle. This should not be surprising. Rescue robotics, and humanitarian UAVs in particular, “are new areas of discovery.” As such, “their newness means there is a lag in understanding how best to capture performance and even the dimensions that make up performance.” To be sure, “performance goes beyond simple binary declarations of mission success: it requires knowing what worked and why.” Furthermore, the use of UAVs in aid and development requires a “holistic evaluation of the technology in the larger socio-technical system.” I whole heartedly agree with Robin, which is precisely why I’ve been developing standardized indicators to assess the performance of humanitarian UAVs used for data collection, payload transportation and communication services in international humanitarian aid. Such standards are needed earlier rather than later since “the current state of reporting deployments is ad hoc,” which means “there is no guarantee that all deployments have been recorded, much less documented in a manner to support scientific understanding or improved devices and concepts of operations.” I’ll be writing more on the standardized indicators I’ve been developing in a future blog post. There are many more important, operational insights in Robin’s book. I highly recommend reading sections 3-6 in Chapter 6 since they provide very practical advice on how to carry out rescue-robotics missions. These section are packed with hands-on lessons learned and best practices, which very much mirror my own experience in the humanitarian UAV space, as documented in this best practices guide. For example, she emphasizes the critical importance of having a “Data Manager” as part of your deployment team. “The first priority of the data manager is to gather all the incoming data, and perform backups.” In addition, Robin Murphy strongly recommends that expert participant-observer researcher be embedded in the mission team—another suggestion I completely agree with. In terms of good etiquette, “Do not attempt first contact during a disaster,” is another suggestion that I wholeheartedly agree with. This is precisely why the UN asked UAV operators in Nepal to first check-in with the Humanitarian UAV Network (UAViators). In closing, big thanks to Robin for writing this book and for participating in the recent Policy Forum on Humanitarian UAVs.